Eager to spread some good advertising news, the network is sharing the results of campaigns from Wendy's, Jaguar and Motorola. Twitter’s advertising story has been less than positive of late, with ad revenue dropping from $641 million in Q4 of 2015 to $638 million in the same period last year. To present a more rosy narrative, the social network will share some encouraging stats around its year-old First View product in a blog post on Monday. Introduced on Feb. 9, 2016, First View allows brands to have exclusive ownership of the top ad spot in Twitter’s timeline feed for 24 hours. "In creating First View, we wanted to give marketers an opportunity to scale their efforts on Twitter even further and place their content in a prime ad slot, helping them reach a prime audience," said a Twitter spokesman in an interview. So far, the evidence suggests that the ad placement drives greater engagement and recall numbers by grabbing users when they’re most open and engaged. "Memory response is highest in the first 30 seconds of a Twitter session, and users are more likely to connect emotionally to content early on," says the blog post, which will be published at noon today. Because First View is one of the first things users see when they start a Twitter session, it increases tweet recall by 141 percent, campaign awareness by more than 58 percent, brand awareness by more than 18 percent and purchase intent by more than 13 percent, according to a study the network conducted with Omnicom Media Group. 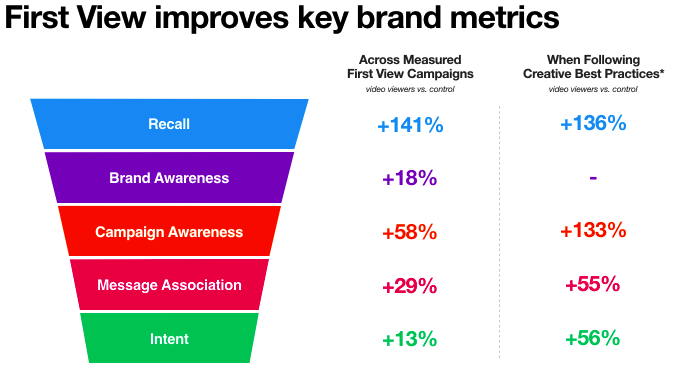 The blog post also shares positive stats from specific brand campaigns. Last April, Wendy’s was one of the first brands to use the ad product. It placed a 15-second video in First View to spread awareness of its "4 for $4" promotion, which allowed customers to pay $4 for four qualifying menu items. The result was more than 5 million video views. Wendy’s saw three times as many brand mentions and two times as many followers than on average, Twitter reported. Another Twitter ad product, a Promoted Trend, can be used alongside First View to increase the effectiveness and reach of a campaign. Made for the platform’s trending topics, a Promoted Trend allows a brand’s specific subject or hashtag to appear first on the list. Jaguar and Motorola have been two brands that have used First View in conjunction with a Promoted Trend. Jaguar paired the two products together for its #UnleashTheCats campaign, which advertised its new luxury vehicles XE and F-PACE. The 30-second video tweet garnered 4.5 million video views, a view rate 22 percent higher than the automotive vertical average, according to Twitter. It also led to a 36 percent increase in positive brand sentiment and a 12 percent lift in brand favorability. In August 2016, Motorola partnered with Ogilvy & Mather and Publicis Media’s Motomentum for #InASnap, a campaign touting the phone’s extra snap-on modules. #InASnap included the use of Twitter’s First View ad product, a Promoted Trend and a custom emoji for the hashtag. By using all three products together, Motorola received three times the daily followers, 19 times more daily average mentions than average and 87.5 million brand impressions. First View is only one of the video ad products Twitter has adopted this past year. Others include dynamic ads during live events like the presidential debates and NFL games, pre-roll ads for video creators as part of its Amplify Publisher Program and the ability to buy video ads on a CPM basis.